There are many places in the country that quickly cover the tracks of the past. The effects of annual rains or growth and regrowth of nature quickly hide and dismantle the evidence of what used to be. Quickly it seems that old logging roads are forever gone, interurban lines tilled into farmland, and schoolhouses dismantled by nature growing from within. There are places, however, where the rains fall more slowly and arid lands make tilling more difficult. These are places where symbols of eras past still cling - "reminders of the glory, the mystery, the sadness of life." Under leaden skies, the past meets the present in Three Forks, MT. 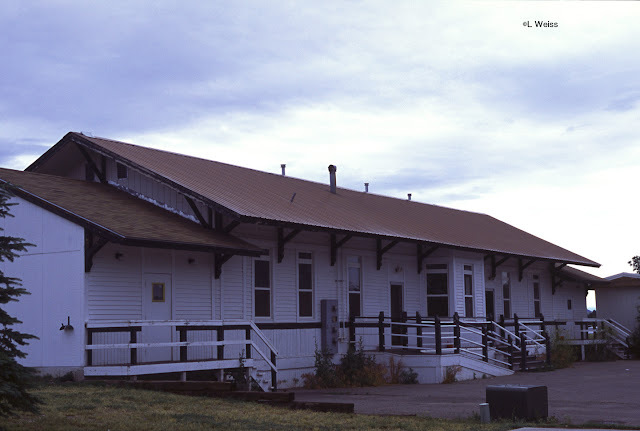 The station reposes as it has for almost a century, but now next to the blowing grasses of a dry open field and not the waiting presence of boxcab helpers for a push over the nearby Rockies. Nearby the Sacajawea Inn stands, still beckoning travelers who seek the mysteries of the West.